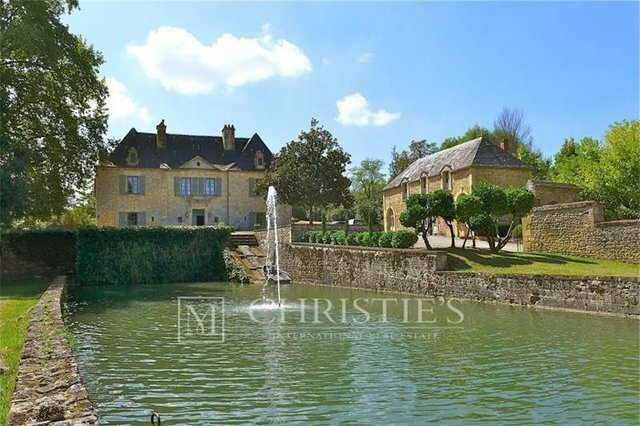 The elegant 18th century chateau, is located in the golden triangle of the Dordogne Valley, 11km from Sarlat. The domaine consists of 7.5 hectares and includes the main main residence with 8 bedrooms, a guest house, and a second charming stone outbuilding, including the 15th century walnut mill. The property was the former residence of the renowned post-impressionist painter, Lucien de Maleville, who produced the majority of his works at his studio at the property. The chateau presents 600m2 of living space, with light and spacious reception rooms, and 8 bedrooms and 6 bathrooms on two floors. There are terraces on the ground and first floors. The 7.5 hectares of land include 4.5ha of walnut grove, as well as meadows and woodland, a mill pond fed by a stream, and a swimming pool. The two charming outbuildings consist of a guest house of 160m2 and a barn and the XVth century walnut oil mill, which has been fully restored and is perfectly intact. There is also an conservatory overlooking to the mill pond.